Nothing beats the gorgeous presentation and flavor of mahi-mahi. Gently grill this clean, light protein source, and either plate it with a radiant yogurt slaw or sandwich it between toasted whole-wheat halves. Lightly grill a piece of mahi-mahi for 3 minutes on each side, then remove from grill and let rest. This important step allows the juices of the fish, previously constricted during cooking, to return to all corners. Make a dressing out of the cumin, yogurt, honey, rice wine vinegar, lime, and jalapeno by combining in a mixing bowl with a whisk. Start by whisking slowly, then more vigorously, until the dressing is consistent. Combine the cabbage, garlic, pineapple, and mango in a separate mixing bowl to create the slaw, or salad. Salt and pepper the slaw to taste. Add half the dressing to the slaw, setting aside the other half. 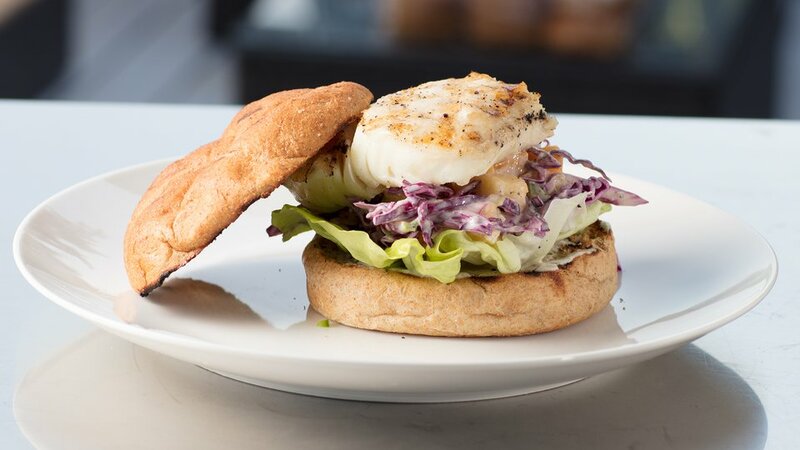 Spread a light amount of the reserved dressing onto the base of the whole-wheat bun, then stack butter lettuce, slaw, and mahi-mahi, in that order. Top with the other half of the whole-wheat bun. For a bread-free alternative, plate the mahi-mahi atop a brush stroke of dressing and slaw, then finish with a fan of avocado slices!